Less than a week is left for Christmas and I suppose all of you must be planning, preparing and shopping. We are busy at our ends too. The holidays for the kids started and we are trying to spend as much with each other and our friends. I wasn’t going to bake anymore over the weekend. I had just got done with the Linzer Cookies, but I kept going back to Meeta’s Florentine Christmas Fruit Cake. I had bookmarked her recipe the moment I had set my eyes on it. I will make that later sometimes. The Florentine topping of her cake had got me floored and awakened my consciously suppressed desire to bite into a fruit cake. What I made today does not even get close to the grand Florentine Cake. I did not have all the ingredients. But what I did today did have all the fruits and flavors and helped to settle down the sudden urge. 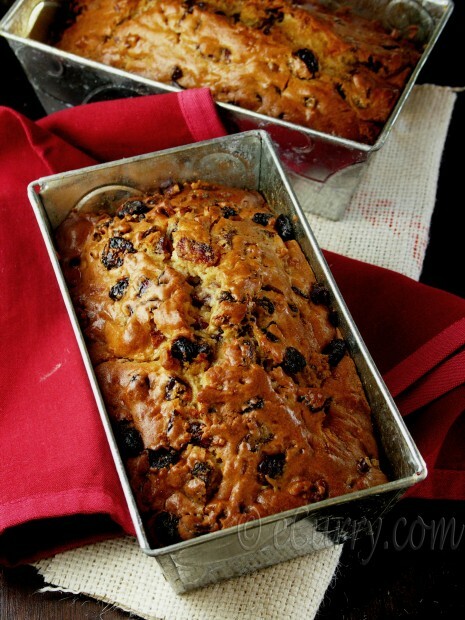 The recipe here is just the regular ingredients used for a basic cake with some spices, dried fruits and nuts. 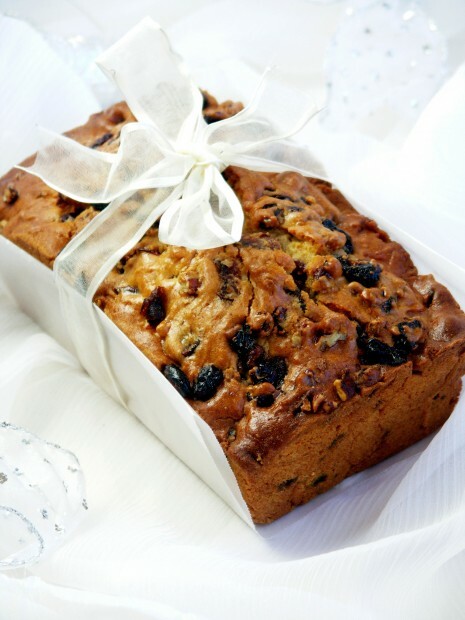 It simply does not feel like a festive season without the boozy fruit cake or the ginger bread. No offense meant, but most Americans squirm at the sound of a Fruit Cake. I am still not sure why. Maybe the entire idea and the feel of a fruit cake is all too European. 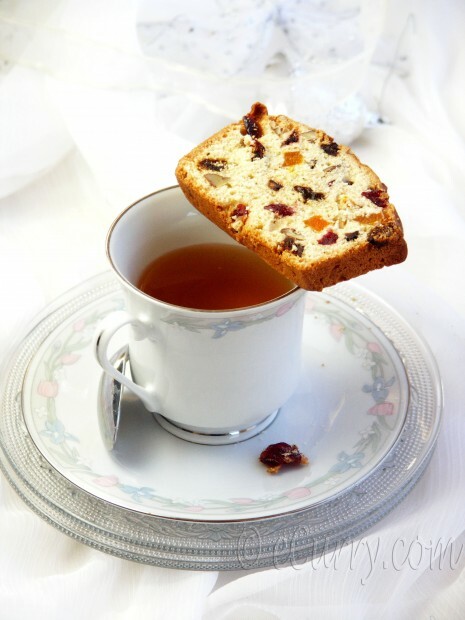 A warm cup of light fragrant Darjeeling tea, the chilly winter mornings and the brown paper wrapped dried fruit loaded cakes are some of the things that had always defined the month of December for me. For myself, I cannot imagine a Christmas without a fruit cake. Sweet memories of enormous bowls of batter, a lot of hands whisking it up, bowls and bowls of dry fruits and orange peels – the aroma still hangs strong. It was my grandmother’s responsibility, but we ALL helped. Then was the late evening baking, which had to happen outside home in the local bakery – for the little oven was not enough to bake them all. Finally came the time when late at night the warm cake wrapped in brown paper or newspaper arrived and of course the first taste of the season – the taste, and the feelings which I will never forget. This is really all I could come up with all the ingredients I had at home. It was fast but good. Call it a quick sweet bread/cake which barely took fifteen minutes to get it ready before it went in the oven. And it had the fruits and the orange peels and the spiced rum – all the lovely bites and aroma to make a real fruit cake. Wrapped up pretty, they would make wonderful homemade gifts for the holidays. Pre heat oven to 350 degree F (180 deg. C). Grease and flour (or use a floured spray) 2 7 1/2 inch loaf pans. Combine all purpose flour and almond flour in a bowl. Add the baking powder, baking soda, salt, cinnamon. all spice and nutmeg and whisk the flour mix to incorporate as much air as possible. Beat butter and sugar in a large bowl till well combined, about 4 minutes. Add egg and beat till fluffy, for another 3 minutes. Add orange extract, orange juice, and rum and beat till everything is just combined, about a couple of minutes. Slowly add the flour mixture to the bowl and beat till everything comes together, while scraping the sides of the pan. Do this in 2 batches. The batter will be thick, NOT a pancake like thin batter. Dust the nuts, dried fruits. candied peels and the zest with flour. Gently fold in the fruit and nut mix into the bowl. Spoon the dough into the loaf pans, half the amount in each pan and bake for 45-50 minutes; once the 45 minutes is done, brush the top of the loaves with the orange juice and sugar mix. Bake for about 10-15 more minutes or till a toothpick inserted comes out clean. Towards the end, if the top turns too brown, cover it with parchment paper. Slice only when completely cooled. A good old bread to be served for breakfast and brunch, or the afternoon tea. Ours were gone while we snacked on it all day long. The cake matured a day or two later – the fruits and flavors infused and every bite filled us with wonderful bites and aroma. Mmmhhh, perfect with a good cuppa! Soma, I love fruit cakes and if I didn’t have my Christimas cake for Christmas I would be so tempted to make this lovely cake. Nice recipe Soma.. By finely chopped orange rind you mean not candied version? The fresh rind? Is that not bitter? Yes I mean the rind not the candied version. and yes it is bitter 🙂 that is the reason I gave the sweetened option. If you chop if very fine (almost like grating), it gives a nice flavor, balances well with the sweet of the cake and the fruits and you really do not feel the bitter on your tongue. But again it depends on personal taste. Back home a little bit of the rind was always used. Tomar ayi caker chobi dekhe choto belaye schoole ekta gaan sikhe chilam seta mone porche…”Boro dine boro bhet, rong beronger chocklate.” Fruit cake dekhleyi Kolkatar boro diner kotha mone pore…. whats happening Soma???? will you believe even I baked this from Meeta’s blog and that too only yesterday. first the Linzer cookies and now this. Actually hubs doesnot prefer plum cake so wanted to make something milder in flavour. but seems like we are baking in unison…but mine doesnot look half good as yours. Sayantani this is not from Meeta’s blog. I have bookmarked Meeta’s recipe, but have not baked it yet. I did not have everything to bake that splendid cake. This is mine own recipe, kind of a combo of a previous spiced rum cake and recipe from back home. about baking together.. i am happy! telepathy going on. any way it is the season to bake. 🙂 Happy Holidays! Thanks for this recipe. 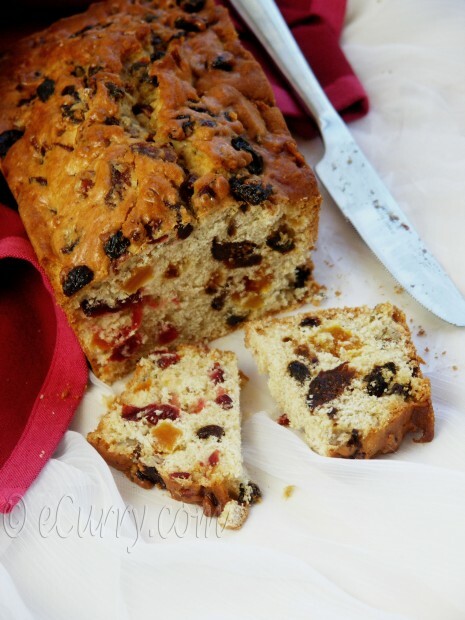 Good to have a fruity bread in place of a traditional fruit cake. Yummy! I’m loving that all my foodie friends are so busy with the holidays and I’m actually kinda bored because I’m not doing anything this year. Hehe. Have a great holiday my friend! Yummyyy….my fav. this time I was planning to bake no more cakes, as done quite a few in the past 4-5 weeks…..but I guess one more won’t hurt…. Tempting bread …..loved the snaps too…..kamon achho?? I love little baked snacks that are perfect with some afternoon tea. That festive bow you put on the loaf is so fun, too! That looks truly lovely…the photographs are amazing… and so delicious. 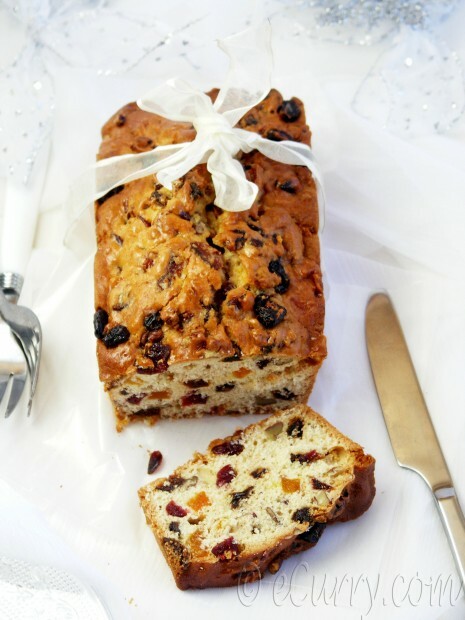 I love the idea of a spice fruit bread, a panettone or sorts, more than a heavy traditional fruit cake. oh my. That looks sooo delicious! This is such a beautiful and festive loaf. Oh god! I had been searching for a recipe with lesser eggs and here it is. But 2 loaves are too much for us. Do you think I can divide the ingredients so as to make 1 loaf only? Very festive and apt for special occasion! This is my kind of fruitcake. 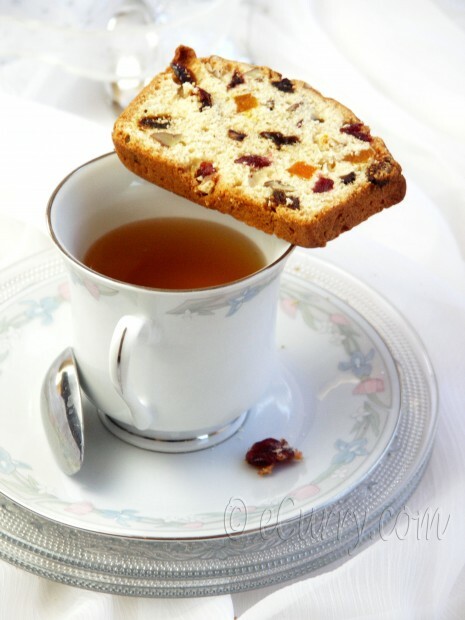 I much prefer a moist light colored fruitcake to those dark heavy cakes. I like how you have incorporated some almond flour into the cake, it must give it a nice texture. Brilliant recipe for Christmas and applauds for that fabulous presentation! That looks inviting!! Perfect with a hot cup of tea!! i love the last pic, that looks fantastic and the cake is just awesome with the cup of tea! Soma, thank you for your support and your kindness. Merry Christmas and very best wishes for the new year. Keep up your lovely blog. It is so appreciated and you are a gem. 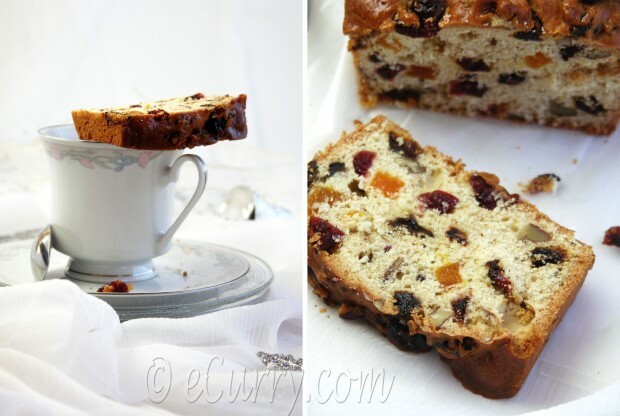 Wow, this cake looks fabulous, lots of fruits and rum…perfect for the Holidays! I am a regular reader of your blog and I also have tried few recipes from your blog. I am in Australia and I made this bread yestrday to say good-bye to wintery days and welcome spring and it came out great !! I was just wonderin (May be , because I use ur blog as ready reference for making/trying any new dish), if you can post a recipe of chewy Bombay Halwa. I have seen the recipe of Turkish Delight on your blog and (even I have purchased a thermometer in a hope that someday I will make my favorite recipe) I guess the recipe for the Bombay Halwa will not be much different except addition of ghee. I would really appreciate if you can post one for me coz it is the most favorite sweet for many of my family members and I really want to make it for this Diwali. Thanks for sharing this wonderful blog with us!!! Gr8 recipe. Can i substitute Egg with Flaxseed? Hi, Can I substitute all purpose flour instead of the Almond Flour? yes you can use all All Purpose Flour. The almond flour was for flavor and a bit of texture. But it can be def. done without it.